2015-16 reopening is currently on schedule. 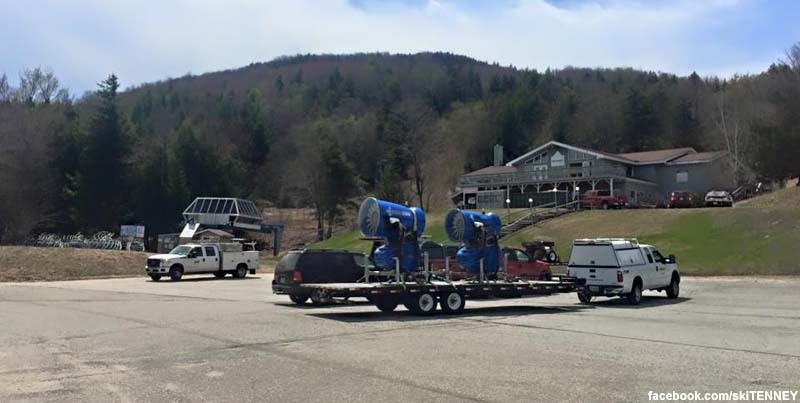 With spring quickly coming to a close, TMDG has been accelerating its work to reopen Tenney Mountain for the 2015-16 season. The Plymouth ski area last operated in 2010. According to numerous Facebook posts, early June work has involved removal of roofing, plumbing, and carpeting in the lodge, as well as initial trail mowing. In late May, both chairlift haul ropes were reportedly successfully inspected. Possible lodge enhancements for 2015 include a new kitchen, new lighting, and new bathrooms. The area's two chairlifts are expected to remain in place for the next two seasons, after which an aggressive expansion plan may commence. Located in Plymouth, New Hampshire Tenney Mountain first opened with lift service in December, 1960. After a bumpy operating history, the area most recently folded in 2010. TMDG was formed in October 2014 and acquired the defunct ski area in November 2014, as reported on NewEnglandSkiIndustry.com. Led by Michael Bouchard, the new ownership reportedly plans to reopen Tenney for skiing in 2015-16 with a 6 to 8 year plan of significant expansion of skiing and non-skiing activities to follow.